At 1:00 pm on Good Friday, a live version of the Stations of the Cross will be presented on the Parish ground by our Hispanic Community. Those attending follow the Passion of Christ; although the script is in Spanish, we are familiar with the Passion of Christ. This realistic presentation is very well done. All are welcome. It is wheel chair accessible. Stations of the Cross will be presented in English in the Church at 2:30pm. 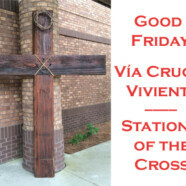 Our Good Friday Service with veneration of the cross begins at 3:00 pm.